Mrs. Margaret Edwards Bryan age 87 of Rockfish Court Apartments, Wallace NC died Monday July 27, 2009 at Pender Memorial Hospital in Burgaw. Funeral services will be 11:00 am Wednesday, July 29, 2009 at Poston Baptist Church conducted by Rev. Allen Overton. Burial will follow in Riverview Memorial Park. She is survived by two daughters, Glenda Bryan Brinson and husband Joe, Gail Bryan Scronce and husband Wesley both of Wallace; two sons, James Ray Bryan and wife Diane of Castle Hayne, Randy Edwards Bryan and wife Debbie of Rocky Point; five grandchildren, Michelle Bowman and husband Doug of Statesville, Bryan L. Brinson of High Point, Gina Bryan Markem and husband Don of Wilmington, Paul Bryan and wife Tammy of Hampstead, Mark Scronce and wife Michelle of Wallace; seven great grandchildren and a special niece, Myrna Thigpen and husband Jerry of Beulaville. A native of Duplin County Mrs. Bryan was the daughter of the late N. G. and Bertha Hunter Edwards. She was also preceded in death by her husband Russell Bryan. 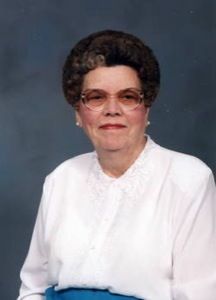 She was a faithful member of Poston Baptist Church and served as the assistant pianist, and was an accomplished musician. The family will receive from 10:30 until 11:00 am, Wednesday at the church and at the residence of Wesley and Gail Scronce, 606 North Harrell Street, Wallace other times. In lieu of flowers the family suggest memorials be made to Poston Baptist Church 4121 South NC 11 Hwy. Wallace, NC 28466.